As the Holidays come into full swing, three Broadway shows have announced closings. 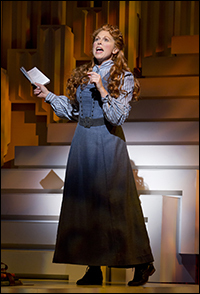 Scandalous, the musical by Kathie Lee Gifford starring Carolee Carmello, will close on December 9th after 31 previews and 29 performances. David Mamet's new two-hander The Anarchist featuring Patti LuPone and Debra Winger will end on December 16th after 23 previews and 17 performances. Finally, Chaplin will last a little longer through January 6th after 24 previews and 136 performances. What will be taking their place? Time will tell.